Recording a video from streaming channel or from TV online is a common task and allows us to get the latest video clips or latest movies, but it gets less pleasant when there are ads in the middle of the sequences. SolveigMM Video Splitter helps to remove them and to enjoy watching a video without being interrupted. 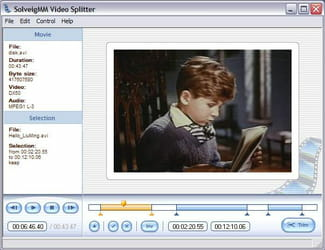 SolveigMM Video Splitter helps video editing fans to split a video file into several segments. It gives the ability to remove unwanted parts without hassle and without video and audio quality loss. Apart from that, it enables joining up two or more video files into a single one. All users have to do is to select and load files to merge, and then define their order. It provides an outstanding result without using any encoding/decoding tool. SolveigMM Video Splitter supports many kinds of numeric media files, whether video or audio. For instance, you can load files with a MP4 format, MPEG-2, MPEG-1, MKV, AVC/H264, AVCHD, AVI, WMV, WMA, ASF, WEBM or MP3 files. It supports batch processing. The software comes with an intuitive user-friendly interface. It is able to trim videos. Latest update on January 22, 2015 at 09:17 AM.